These are the metal brackets and wires that most people picture when they hear the word “braces,” although today’s metal braces have come a long way! 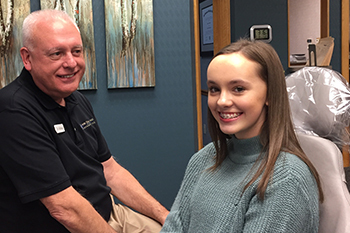 For many patients, our traditional Orchard Park, Elma, and Williamsville, NY, braces are still an effective method to correct most orthodontic issues. At More Than A Smile Orthodontics, we use metal braces made of high-quality stainless steel or titanium – manufactured right here in the U.S. by American Orthodontics. When you opt for metal braces from More Than A Smile Orthodontics, your appliance will consist of three key parts: brackets (aka braces), archwire, and ligatures. The brackets are attached to the teeth using special bonding glue. The archwire placed in each slot applies pressure to move each tooth to its carefully determined position. Finally, the ligatures, or elastic rubber bands, hold the archwire to the brackets. These bands come in a variety of colors, giving you the opportunity to express your creativity by choosing a different color at every appointment. Schedule Your Free Smile Assessment Today To Learn More About Our Orchard Park, NY, Elma, NY & Williamsville, NY, Braces! Want to learn more about how our Orchard Park, NY, Elma, NY & Williamsville, NY, braces might be your best treatment option? Call 716.633.4747 or click here to use our convenient online appointment request form. We look forward to hearing from you! Come experience More Than a Smile Orthodontics! You will quickly discover that we offer state-of-the-art Orchard Park, NY, Elma, NY and Williamsville, NY, braces – Serving Williamsville, NY, Elma, NY, Orchard Park, NY, Amherst, NY, Clarence, NY, Tonawanda, NY, Hamburg, NY, East Aurora, NY, Lancaster, NY, Buffalo, NY and West Seneca, NY – and we do it with a smile. We’re ready to help you achieve a healthy smile in less time!